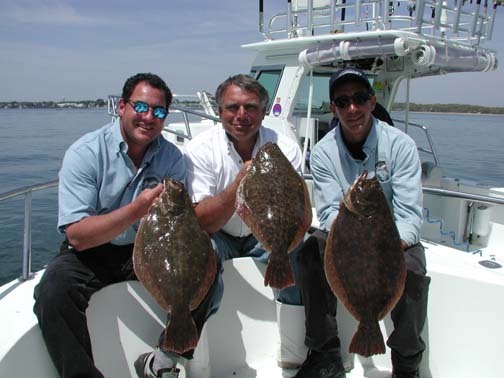 The May 19 fluke fishing visit to Orient Point, Long Island was quite successful. Andy and Rich’s guest, Capt. Bob Rochetta of Rainbow Charters, was right on the money when he described the action. The conditions were perfect, the bite was on, the action rarely stopped and there were numerous double and triple headers. Rich, Andy and Bob really put their tackle to the test battling more fish than they could count. Nearly all of the fish were of legal size and many were in the 4-5lb range, with the largest at around 8 lbs. All of the fish were caught either drifting or stemming the tide at depths ranging from 30-50 feet. If you have questions about any of the fluke fishing equipment used during the show, please contact us.